We like to find adventure and excitement in every area that we visit, and we prefer to stay in luxury most of the time. We fill our days with numerous stops and activities, packing each one to the max. We are willing to step out of our comfort zone at times, and we will give up luxury if we have to in order to reach remote places and cultures. Our children at the time of this itinerary: 2 children-Boy age 16 years, Girl age 18 years. Description: Geysir Hot Spring is one of the most well known natural formations around the world, and this geyser has spouted since at least the 13th century. Today the Geysir does not spout as often as some of the others in the area but when it does it is a sight to see. The frequency of eruptions slowed considerably at the beginning of this century, now the Geysir only spouts a few times a day. but visitors can see other geysers in the area that are much more active as well. The word geyser actually derives from this attraction, it is the source for this term in the English language, and it is visited by many people each year. 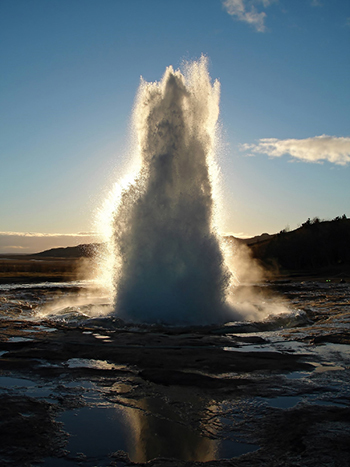 Our Experiences: The Geysir Hot Spring was very interesting, and the natural geothermal formations and features in the surrounding area just added to the excitement of this stop. The scenic landscape was very beautiful, and the large number of geysers in the area in addition to Geysir means that everyone who visits will see some type of geothermal activity on most days. This hot springs contained warm water that was rich in minerals, and watching the spouting of the various geysers in the area was unforgettable. This is a great stop for families who love nature, and for those looking for unusual stops not found in most places. Description: The Gulfoss Waterfall is one of the popular attractions on the Golden Circle Tour in Iceland, and this waterfall is one of the most popular in this nation. Translated to mean Golden Waterfall, this wonder of nature can appear to have water that is golden in color when the light is just right, and this is caused by suspended sediment that is picked up as the water rushes along. Many consider the Gulfoss Waterfall to be the most beautiful waterfall in Iceland, and it is a top attraction for visitors and residents both. Our Experiences: The Gulfoss Waterfall was a stop that we enjoyed very much. The scenic beauty of the area is rivaled only by the spectacular views of the falling water, especially when the waterfall appears to be golden. From some areas where we were it seemed like the river just disappeared into the earth, and this optical illusion was incredible. We all liked this stop very much and it was a great place to relax and enjoy the natural beauty that Iceland is famous for. We gave this attraction a big thumbs up, and we recommend it to other families that enjoy nature and unusual settings. Description: A snowmobile tour of the Langjokull Snowfields can be an exciting adventure, with plenty to see and do for everyone. Racing a snowmobile across the icy terrain and enjoying some of the best scenic beauty that Iceland offers can be a fantastic way to see and experience this area. Most tours include a stop at the Langjokull glacier, and some tours even include a glacier climb. It is important to note that weather conditions can change quickly, and tour itineraries may be altered due to road or weather conditions to ensure the safety of the group. Our Experiences: We had a blast on our snowmobile tour of the Langjokull Snowfields, this was a unique experience that was a lot of fun for every family member. We had a great view of the glacier and the snowfields, and it was exciting to ride snowmobiles through the pristine area. This was a thrilling stop that was unusual and it was a true adventure for us. This stop was a great way to see the snowfields and glacier, and the snowmobile rides were fantastic. This type of tour may not be ideal for families with small children or those who are not active at all though.